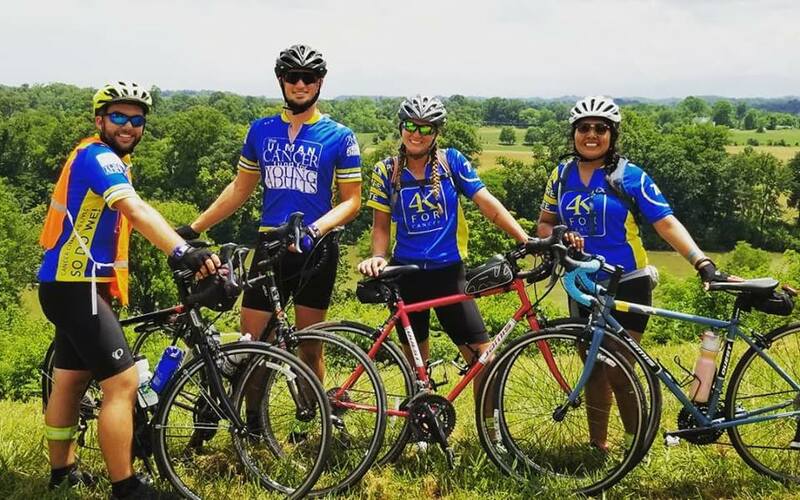 Apply to join a goup of young adults biking across America to fight cancer! Ride Across America. Fight Cancer. 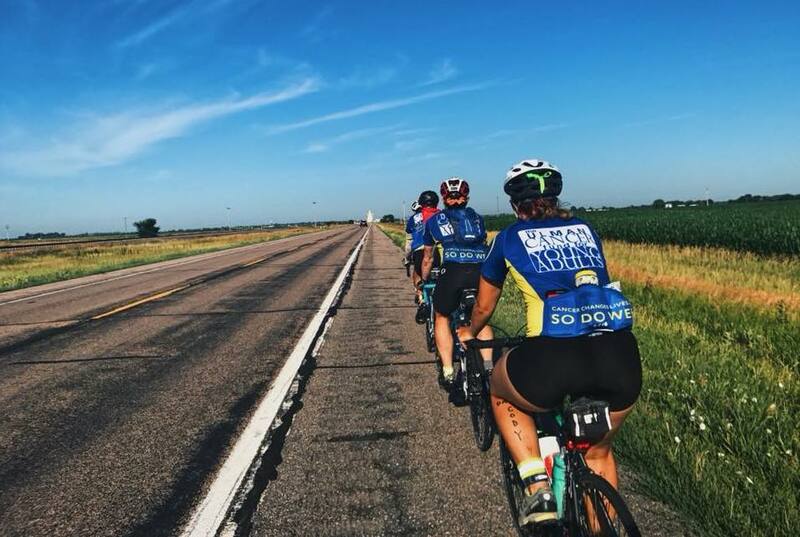 Join a group of young adults riding their bicycles from coast to coast each summer to help raise funds and awareness for young adult cancer. Pick from 3 routes that venture 4,000+ miles across America over 70 days, June 2 to August 10, 2019. It will be a summer to remember. Are you crunched for time but want to learn more about 4K? Let us know what you’re interested in and we’ll be in touch soon with more information about applying. It’s as easy as 1-2-3: 1. Fill out the online application! (Apps are reviewed on a rolling basis.) 2. Once contacted, schedule a phone interview. (Takes about 30 minutes… or one netflix episode). 3. Accepted applicants will fill out the registration form and pay $100 registration fee. Go ahead – click the “Start Your Adventure” button above to get started. You know ya want to! Our program is for young adults, 18-25 years old. Looking for those with a love for adventure and giving back, and no previous cycling experience is needed! What is the daily mileage covered? Riders bike between 50-120 miles per day (avg. 75-80 miles). Am I responsible for carrying my own gear? I don’t know… are you? Just Kidding! Support vehicles will carry gear and luggage. Churches, schools, gyms, YMCA’s, rotary clubs, and the occasional campsite through National Parks – anywhere that provides a safe place for our teams to rest their heads at night. I hope you like pizza, sandwiches, and granola bars! Don’t worry a home cooked meal is right around the corner – hosts typically provide breakfast and dinner. For lunch, participants seek out food donations from restaurants and grocery stores. Don’t worry! We’ll supply the bike. Once a rider hits the $1500 fundraising goal, they’ll be eligible to receive their sweet ride. – Important things to note though: If a participant’s bike breaks or is damaged while training or on the trip, they are responsible for the repairs – Ulman will not replace or repair bikes before, during or after the ride. If a participant withdraws from the program prior to reaching the minimum fundraising goal (and prior to the trip’s start), they must return their bike. All the swag! Three cycling jerseys. A branded t-shirt, long sleeve shirt, sweatshirt, and duffle. Safety is important too! You’ll be given a road ID and two reflective bands at orientation. What biking equipment do I need? Safety comes first! All riders must have a helmet and bike lights. But we also recommend purchasing cycling shoes, cycling shorts, water bottle cages, and more. Check out our gear guide for more advice. What else is important to have? Each 4Ker is different, but there are some must-haves we recommend: sleeping bag, sleeping pad, quick dry towel, toiletries, small pillow. Check out our gear guide if you’re interested in seeing the entire packing list recommendations. What is the fundraising minimum? $4,500 big ones (or 450,000 pennies). Fundraising tips and tricks, plus frequent check in calls with our awesome staff, will help support your efforts. It helps Ulman Foundation change lives (everyday) of young adult’s facing cancer. What types of service events can I expect? This is where you change lives. Deliver a scholarship, cook a meal, chat with patients. You’ll get to share your why and see our community grow. Are there service requirements before the trip? TBD – We’re still working on some exciting changes in this department! Be on the lookout soon for an update. What leadership opportunities are there? We have 5 different leadership positions – Director (2), Leg Leader (6), Mechanic (1-2), Mission Coordinator (1), Media Coordinator (1). Read our leadership guide to learn more about each position. Can I receive college credit through 4K? You sure can! Check out our credit opportunity site to see how to get started. Applications are open for the summer of 2019! For me the 4K is a time to heal. A time for me to honor the loved ones that I have lost to cancer. It is also a time for me to slow down from my busy life and enjoy all the beauty that our country has to offer. It has been an adventure of a lifetime. The 4K teaches lessons unable to be read in a textbook, carried out through an experiment or written in a paper. To take yourself out of your normal setting, be it class, work or the comfort of home, is the invaluable experience the 4K gives. It challenges you to dig deeper than you ever have before, listen, learn and rely on those that are different from you, and use the stories of those you meet along the way as inspiration to achieve a goal. If offers clarity about life that is incomparable to any other experience, causes you to think and act outside of your comfort zone and teaches that as a team you can, and will, change a world — even if it’s just a single person. The 4K has forever changed who I am today, from how I approach a challenge to how I commute to work in the mornings. I encourage anyone who longs to see the world and change it for the better to become part of this family. I went into the 4K expecting an incredible experience and left with a beautiful and supportive family that I can depend on forever, as well as a refreshed perspective on life. The amount of personal growth that came from pushing our boundaries every day is astonishing and the effects of the 4K are felt every single day since it has ended. I’m the best version of myself I’ve ever been and I owe everything to my teammates and the mountains we climbed together. Before 4K, I thought I knew what it meant to be a cancer survivor but I was so wrong. 4K taught me what it means to live beyond my diagnosis and gave me a way to turn my experience as a survivor into something positive and an opportunity to help encourage others to do the same.